If you are in the market for the best dog brush for shedding, it’s a good thing that you are reading this article. 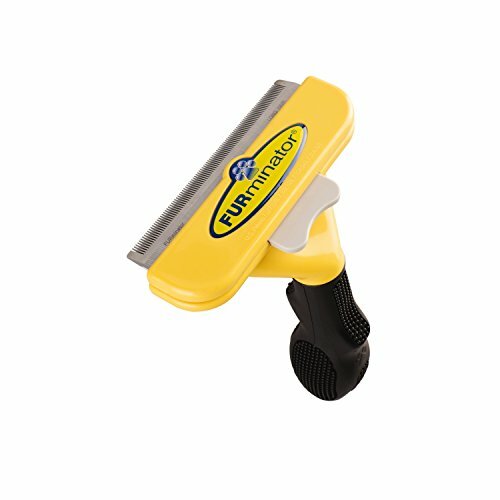 Based on the hundreds of reviews that we have gone through, it appears that the product that you ought to consider is the FURminator Firm Grooming Slicker Brush. It’s one of the most effective items in this line and it even detangles and smooths the fur of your pooch without pulling on it. You can remove the fur that’s just about to fall off, and you can also give your canine buddy a nice massage, too, since this one is made specifically for finishing coats. Also, it applies gentle pressure on your dog’s skin, so that’s another thing to bear in mind. If this product is no longer available, check out our next favorite option, the Miracle Care Pet Slicker Brush. This hair removal tool is effective, easy to use, and gets the job done with as little effort as possible. It’s also very comfortable to hold in one’s hand since it is equipped with an ergonomic handle. It is not designed to trim your dog’s coat, but it will remove any fur that he or she might be shedding. Since the wires are flexible, they have a tendency to bend too easily, and that’s not something that some pet parents like. This fur removal tool can be used with ease and it provides a nice massage for your dog, too. 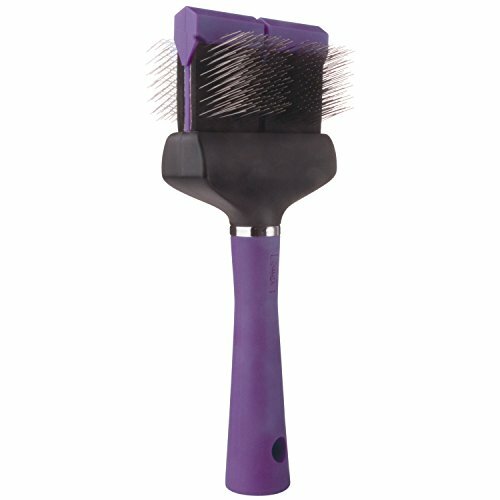 This budget-friendly slicker brush is capable of reaching into the undercoat of most double-coated breeds and remove the fur as conveniently as possible. One thing we like about this unit is that it comes with angled flexible pins, so it is almost incapable of hurting your dog’s skin. There have been some issues reported with regard to the durability of this item. The handle tends to break after a while. 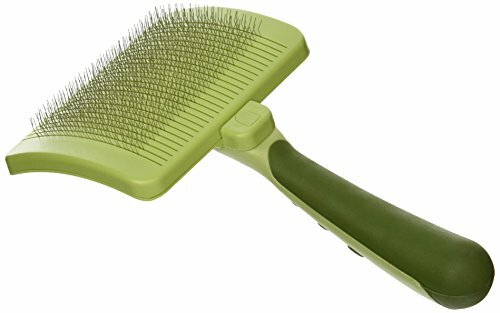 This user-friendly brush can be used in the springtime or summer for dogs that shed a lot. This grooming brush provides excellent results for most dog breeds, whether they have a longer or a shorter coat. The two sides that the brush is equipped with can smooth the coat, detangle it, as well as remove part of the oils from the skin. It’s a sturdy brush that’s highly recommended for long-haired breeds. Because it is double sided and it tends to weigh more than similar alternatives, it’s harder to maneuver. If you’re in the market for a durable pin brush, the Wahl option is definitely one to consider. We’re well aware that getting a good dog shedding brush is challenging these days, and even more if you want to find the best dog brush for short hair. That’s why we showcased some of the most effective models that we came across below. Check them out if you have a little time on your hands. 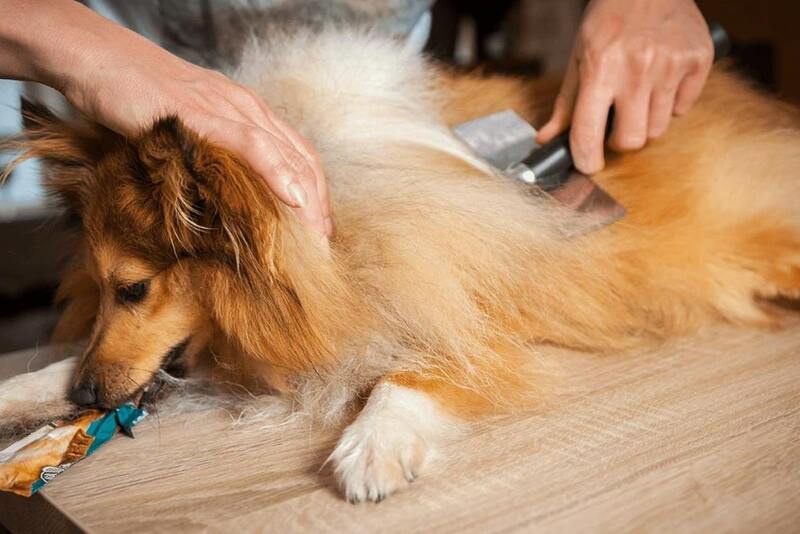 FURminator is one of the best-known names in the industry of pet accessories, and for a good reason, too. The company makes some of the most remarkable fur removal tools ever to have been invented. 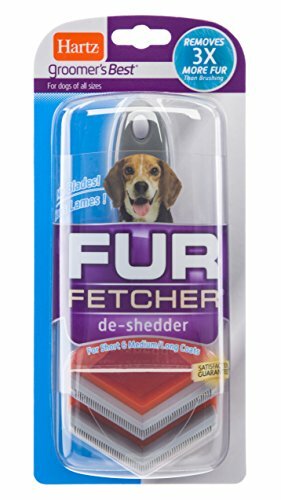 While this one isn’t specifically designed to also trim your dog’s coat, it does the trick if he or she is shedding a lot. 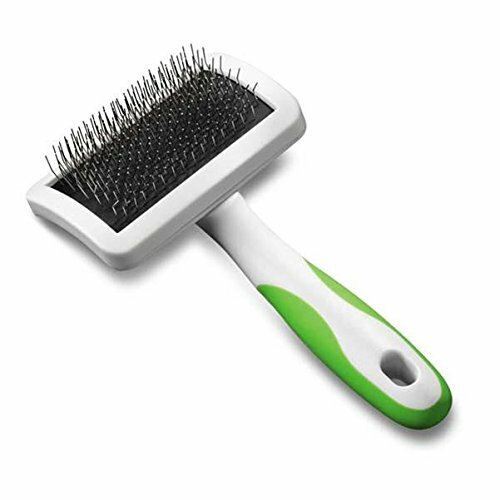 The brush is easy to use and comfortable to hold, and the best thing about it is that it applies considerably less pressure on the pet’s skin compared to similar alternatives. It’s capable of finishing your Fido’s coat and it creates a nice-looking natural shine. 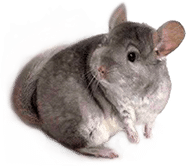 It can be used on pets that have medium, long, or curly coats, and that’s because the pins can be a little too harsh on breeds that have very short hair. One of the complaints about this model that we came across is that the wires bend easily – they are flexible. 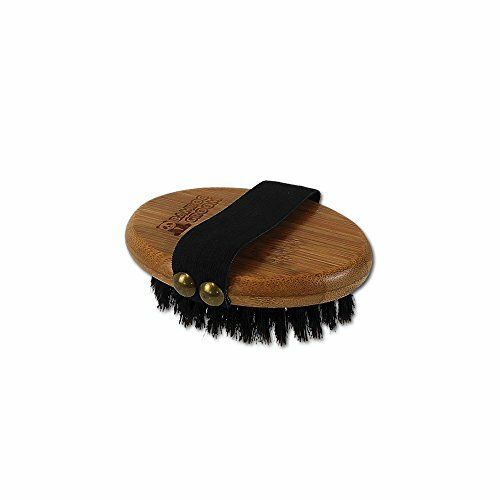 Available in two sizes – small and large -, this is a budget-friendly slicker brush for dogs that gets the job done. 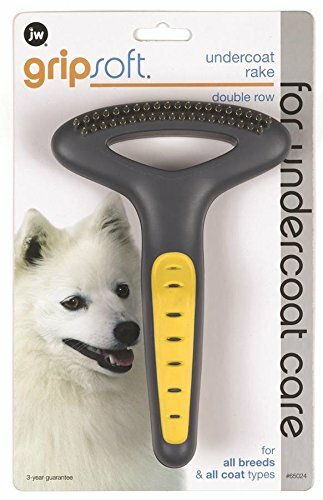 It reaches the undercoat present on most double-coated breeds, and it comes with angled flexible pins that make for effective grooming without ever irritating your dog’s skin. The pad is quite soft, too. Another aspect that makes this unit worthy of your consideration is the fact that it is equipped with an ergonomic and cushioned grip that prevents hand strain. You will find it easy to use every day, therefore helping you establish a grooming routine. It’s very good for breeds that tend to have tangled hair and for those that shed a lot in the summer – at least that’s what some of those that have purchased it in the past say about it. Some customers note that you have to be gentle with the brush because the handle might break in a matter of five to six months otherwise. If you would like a little more reassurance that you aren’t hurting your canine buddy’s skin, perhaps this product by Wahl might be right up your alley. It’s a dog grooming brush that works for most breeds, whether they have a longer or a shorter coat. The ergonomic and no-slip handle that this unit is outfitted with makes it easy to maneuver, allowing you to brush your dog’s coat in as little time as possible. There are two sides to this brush – and they are designed to smooth the coat, detangle it, and even remove the oils from the skin. Some of the individuals that have given this product a try say that they recommend it for long-haired breeds. It’s also quite sturdy when compared to others, and it’s so effective that customers have never gotten to get it hair-free. However, because it is double-sided, it’s heavier and more cumbersome to maneuver. This Furminator dog brush isn’t a brush per se – it’s a tool that actively removes the hair that your dog will shed all over the house if you do not tend to a grooming routine. Available in sizes ranging from extra small to giant, this product is made for dogs that either have short or long hair. Just pick the one that’s best for your pooch. Similarly to other products, this one comes with an ergonomic handle that makes the task of brushing your doggy’s hair a really easy one. The difference is that this one is perfectly capable of removing the loose hair without damaging the actual coat or cutting your dog’s skin. 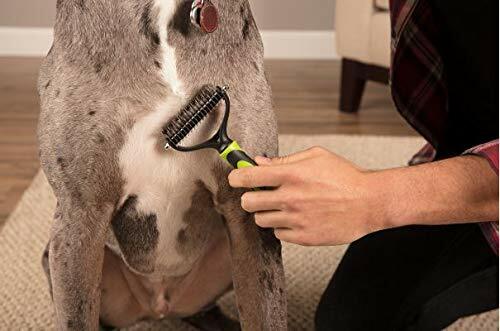 The long hair stainless steel edge that this item is equipped with can reach deep beneath your dog’s long topcoat so as to safely remove the loose hair and the undercoat. Once that’s collected, you can just push the button to get rid of the hair. Safari’s alternative is pretty typical when you compare it to other items that we have showcased here. It’s easy to use and available in sizes ranging from small to large, so it can be used by people with smaller or bigger hands and on dogs that are tinier and larger. The best thing about this pin brush for dogs is that it works with almost all coat types. You can use it daily since it comes with an ergonomic and partially rubberized handle. The pins are made of stainless steel and you can retract them so as to clean up the brush with ease. While it might seem basic in comparison with some of its competitors, the truth is that this can be an effective deshedding brush for dogs if you stick to your grooming routine. And in the summer, when the shedding gets very serious, you probably need to brush your dog’s coat every day. If you like the idea of being eco-friendly and you would like to get products that are made of natural materials and live a greener life along with your pets, perhaps this product is just the right one for you. It’s made of bamboo and it comes with natural boar bristles, so you can rest assured that they won’t hurt your dog’s skin. That’s what makes it such a good choice for dogs that have shorter coats – it’s virtually incapable of damaging their skin. They’ll get a nice massage and you will get the reassurance that your canine companion won’t shed fur all over the house. Similarly to a dog brush glove, you need to hold this one in your hand. That is an advantage for people whose hands get tired when holding a handle for too long. While it does offer great results, some customers note that it doesn’t remove dirt and dust very well. 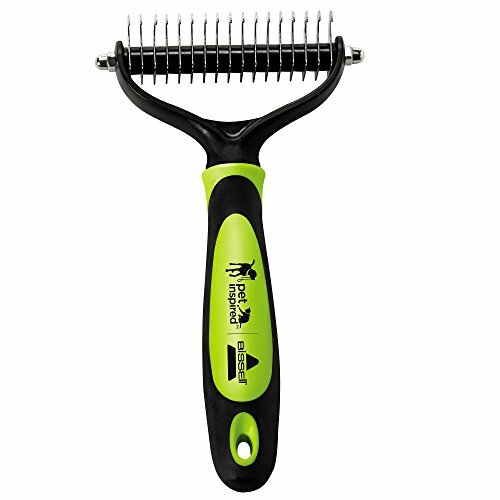 This is another pin brush for dogs that gets the job done with minimal effort and maximum results. 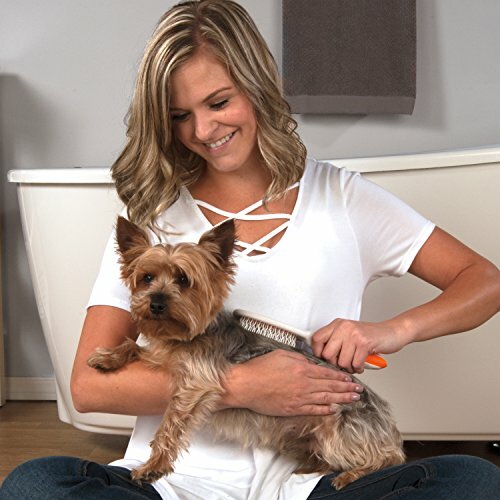 It’s easy to hold since it comes with an ergonomic handle, and it’s fully capable of untangling and separating your pooch’s fur. Besides, it is equipped with rounded pins so that it doesn’t hurt your Fido’s skin. Given that it does a good job at removing mats from breeches and the undercoat, we thought it might be useful to include this unit in our list. Beware that this one is intended for pets with longer coats, so it is not a short hair dog brush. 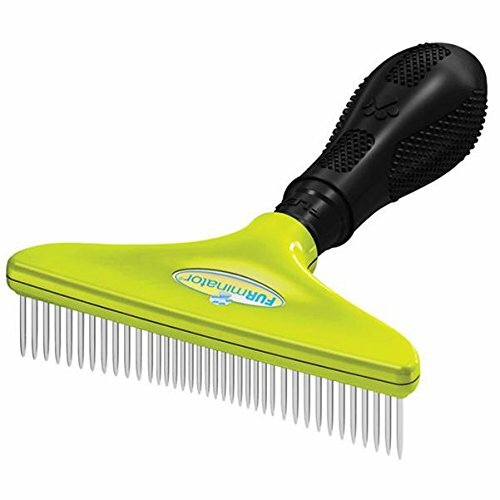 Many of those that have tried the Furminator Rake say that it is excellent for weekly maintenance and that in times of heavy shedding, they recommend getting both this one and the deshedding tool by the same brand. Beware that this one does not come with a release button but you can pull the hair right off. 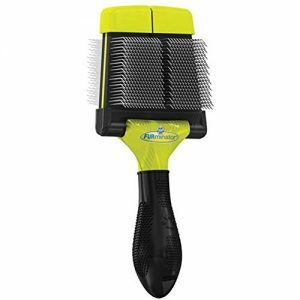 If you’re in the market for a new pin brush for dogs, the Andis model might fit the bill. When used regularly, it is more than capable of eliminating matting, as well as tangling and it can actively reduce shedding by up to 90%. Furthermore, the manufacturing brand claims that it can also remove quite a bit of hair from the topcoat and undercoat. Given that it is outfitted with an easy-grip handle, this brush can allow you to brush your dog’s coat with minimal effort. From what we have gathered by going through the ratings received by this product, it seems that it is highly recommended for long, thick-haired dogs since it is highly durable and will put up with a lot of abuse over time. If what you need is a tool for thick fur, one that is capable of going deep into it and removing excess hair, check out this alternative. The Oster grooming rake is more than capable of removing dead fur from the undercoat with as little cutting as possible. It is a great choice for medium to large breeds that have medium to thick undercoats. Having been equipped with blades made out of stainless steel, it’s pretty clear that this unit is capable of withstanding the test of time. Its rust-resistant design, as well as the fact that it is so easy to clean are two other pros to consider. While it does come with rounded ends, we do recommend using it with caution. For breeds that shed a lot and all throughout the year, this tool can really make a difference. People that have breeds like Australian Shepherds speak highly of this long hair dog brush, and they say that it doesn’t cut the hair at all. So, if you aren’t looking to give your dog a haircut, this brush should be right up your alley. As basic as it might seem, the GoGo Pet Products alternative is definitely one to keep in mind since it is remarkably easy to utilize. It is a good fit for most breeds, whether they have short or long hair. It can remove loose fur as well as tangles, and it is more than capable of spreading your dog’s natural skin oils throughout the coat so as to give a healthy-looking shine to it. You can also customize the length of the hand strap depending on your physical attributes, and that means that everyone in the household can tend to Fido’s grooming routine, whether their hands are smaller or larger. Although it is primarily marketed to dog parents, we couldn’t help noticing that this item has received quite a good deal of appreciation on the part of cat owners, too. The rubber base is deemed flexible and the pins are rather thin, so some say that it might not be a good fit for a particularly large dog. This is a rather unique de-shedding tool since it doesn’t come with any sharp metal parts that can remove the hair. It does, however, do a good job if you’re looking for a short hair dog brush that can also remove the hair that some breeds lose during spring. It is capable of removing loose fur from the undercoat without producing any harm to the skin and top coat. The model is equipped with an ergonomic handle, so it is comfortable to use. You won’t have to waste a lot of time grooming your pet, although we hardly think of it as a chore since the doggy also gets a nice massage, too. Since it uses micro combs to get rid of the fur, this product is deemed safer than similar alternatives. It works for feline companions, just as well, at least based on the customer feedback that we have analyzed in this sense. 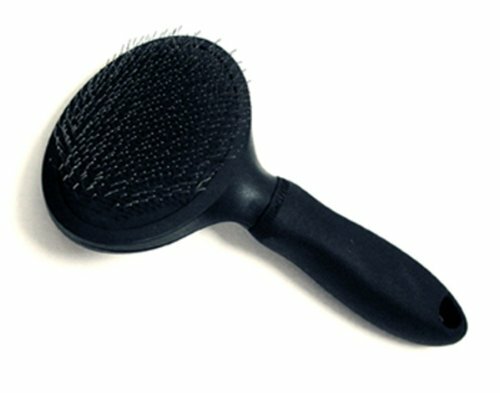 The unique rounded edge teeth that this rubber dog brush is equipped with make it impossible for your dog’s skin to get hurt as you tend to your grooming ritual. This unit works for removing shedding undercoat, for dematting your canine companion’s fur, and for regular brushing, too. You can effectively utilize the 9-teeth side for tangles and mats, and then you can finish with the 17-teeth side designed for deshedding purposes. Due to the way it is built, it works great on pretty much all types of dog breeds, especially the long-haired ones. It even works great on cats. From the consumer reports that we have analyzed, it seems that this product works great for long-haired breeds. It can provide excellent results for dogs such as Great Pyrenees and German Shepherds, and it removes so much hair that some argue that they could even stuff a pillow with what they collect every week. This double-sided slicker brush is another one to consider if you are in the market for products that can actually get the job done. It is very easy to hold in your hands and it produces less strain, which means that you will find it more comfortable to use and as such, you’ll brush your dog’s coat more often. Since this particular one is rather large, we recommend it for bigger dog breeds. It doesn’t cut the dog’s fur like the Furminator models that we have also described here, and it provides a nice massage. 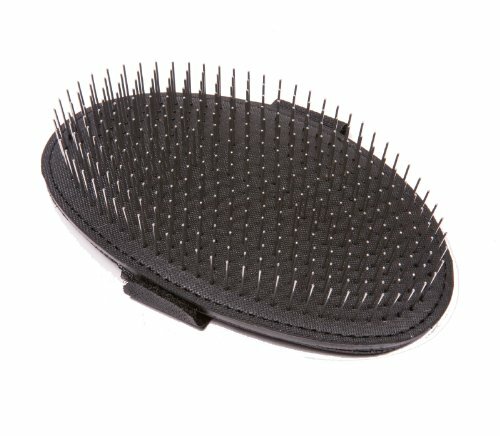 Keep in mind that this is not a short hair dog brush, so we would advise you to avoid using it on such a breed. Some buyers say that the tines are too sharp and that dogs with sensitive skin might not find the whole process enjoyable. For others, though, it seems to be the perfect tool – so it largely depends on the pet. If you are looking for a product that’s quite easy to use, this one might be worthy of your consideration, as well. It can loosen the matted parts of the coat with gentleness, and it comes with as many as two rows of round-tipped teeth. As such, it’s perfect to use even on dogs that have somewhat sensitive skin and might not typically enjoy brushing. Furthermore, the tool is capable of lifting out shedding and dead hair from the dog’s undercoat. Due to its unique features and its gentleness, it speaks to the needs of pretty much all dog breeds. It’s also worth noting that the JW Pet Company brush is equipped with an ergonomic, non-slip handle, so you won’t have any trouble maneuvering it. Some of the feedback that this unit has acquired from the actual buyers is rather positive since there are loads of pictures of dogs being brushed and they look like they haven’t had that good a time in a while. 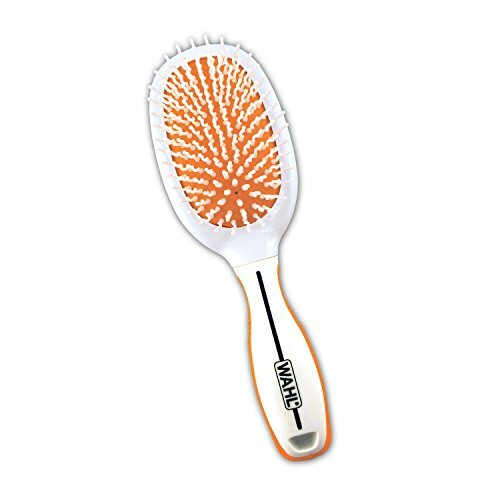 Having been uniquely designed to fit the needs of medium to long hair dog breeds, the Paw Brothers double sided flex slicker brush is another choice to bear in mind. It comes with stainless steel angled pins and it even boasts a non-slip, comfortable grip, so you won’t find it a chore to brush your dog’s coat regularly. It’s quite a durable option, too, so it does tend to last for a good deal of time. It’s not as budget-friendly as some of the other choices that we have come across, but it definitely gets the job done. If you take the time to look through the reviews garnered by this product, you’ll notice that most of them speak highly of its capabilities. There are even reports from people saying that they’ve tried dozens of brushes before and this one has proven to be the right tool since it’s also loved by their pet, too. Finding the right brush for shedding for your dog can be a true challenge in this day and age, and that’s because the market is downright overflowing with alternatives. Some of them are cheaper, some of them are expensive, but the bottom line is that the one you truly need is the most effective one. Let’s look at some features you need to take into account before deciding on a model. As you might imagine and as is the case with hundreds of other accessories made for dogs, a deshedding tool can mean something entirely different from one person to the next. When purchasing in this category of products, you can choose between a slicker brush, a bristle brush, a blade-on-a-handle metal comb, or a rubber brush. The ones that are equipped with blades are by far the most effective ones, but you will also remove some of the topcoat, as well, and that’s something that some dog parents might not necessarily be looking forward to. Bristle brushes work for all types of coats, rubber ones are great for loosening the hair and all sort of debris, and slicker brushes are best used on long-haired, dense-coated dogs. If you want to remove the fur per se, you need a de-shedding tool that both brushes and trims your dog’s hair at the same time. These days, dog brushes can be made from a variety of materials, but the most important thing to keep in mind is to try to avoid those that are constructed of cheap plastics. Needless to say, such models aren’t going to last for a good deal of time, and you will become frustrated if you have to replace your dog’s brush time and again after using one for just a couple of months. Better models are always made from quality rubber or stainless steel. The handle has to be ergonomically designed and it needs to be made of either plastic or rubber. The reason why steel isn’t typically used on the handle is that it tends to be slippery. The dimensions of the product also have a say when it comes to user experience. In actuality, you will waste a lot of time brushing your dog’s coat with a really small brush if he or she is big and you’ll find a too large brush cumbersome to use on a small dog. No matter how much you love spending time with your dog, brushing his or her coat can become a chore when you’re using the wrong tools. Naturally, all of the manufacturing brands that make dog brushes for shedding will tell you that their products are the best. But how can you make sure that you avoid all of this (possibly even untrue) information and actually get the right product? Those that make decent units will specify the percentage of shedding reduction. For example, one of the models that we have showcased in our selection above has a 90% shedding reduction percentage – that is what you should be looking for. The shape, the teeth, and the general capabilities of the model you might be considering can also give you a pointer as to whether it works or not. Finally, it’s a good idea to read as many reviews from actual customers as you possibly can, because other dog parents will offer golden nuggets of information that you most certainly won’t get from press releases or any marketing jargon. It would be very useful if you managed to get a brush that’s the easiest one to clean. If you have a dog that has dandruff or excess sebum, for example, the brush will also collect the debris and quite a lot of natural oils, so you definitely need to be able to wash it later on so as to avoid brushing your dog the next time with a dirty tool. Some of the tools that are designed like combs can be very easy to clean – and some even have buttons for releasing the fur they’ve collected. You want one that’s as easy to maintain as possible.